I have a lot of ideas for my blog, most of which either a) I forget about or b) I don't do anything about because I don't have the time, motivation, or some combination of the two. Like that time I was going to start a spinoff tumblr where I featured photos of myself eating piles of junk food while wearing athleisure outfits (I even bought the domain lifeofathleisure.com), or that time I was finally going to reach out to the book agents I've been flirting with to see if any of them were interested in The Hummingbird High Cake Coloring Book. Neither has happened. Ehem. Yet. I suspect that most of my blog friends have this same issue; scrolling through my text message threads, we talk about a lot of post and sponsored trip ideas that we've either forgotten about and/or put on the backburner for when we all finally have the time (lol). But every so often, a mini miracle occurs and we all pull ourselves together to actually make something happen. 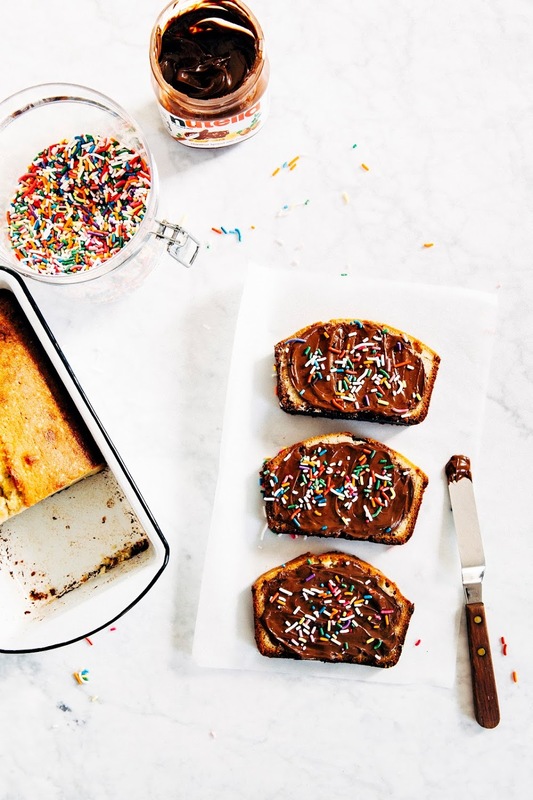 "steph and i are on a mission to make cake toast a *thing*... just toasted slices of loaf cake (or other cake) with toppings." "yah, i'm super into loaf cake with stuff on it. like piles of cream cheese." "dude, yeah, i'm surprised it's not a thing already?! *SLAMM = Steph, Lily, Alana, Molly, and Michelle (just in case you haven't figured it out by this point)! **SIDE NOTE — I feel like the above screenshot from my iPhone is very revealing, like you just saw something you weren't supposed to. Or something. Because yes, I stay up late to write blog posts. Yes, I have a weird naming convention for the Contacts on my cell phone. And yes, if you are a Blogger and I have your number, your name is definitely in my cell phone as First Name Last Name Blogger. It's how I remember who you are. Yes, I'm weird, I know. And yes, I am a reluctant AT&T customer. Now you know all my secrets. So for the last three months, I've literally been wondering why cake toast isn't a thing. I've always toasted (or griddled) my leftover slices of loaf cake, pairing them with jam and butter the few days after it's been baked. Loaf cakes tend to dry out easily otherwise. Hasn't everybody else been doing that too? In any case, if you missed the memo, DO IT. Bake your favorite loaf cake, slice as you go, and toast 'em. Because it's basically like eating cake that's still warm and fresh from the oven. If you want extra texture, you can even toast the cake on high like I did to get a thick, crunchy crust similar to a loaf of artisan bread. 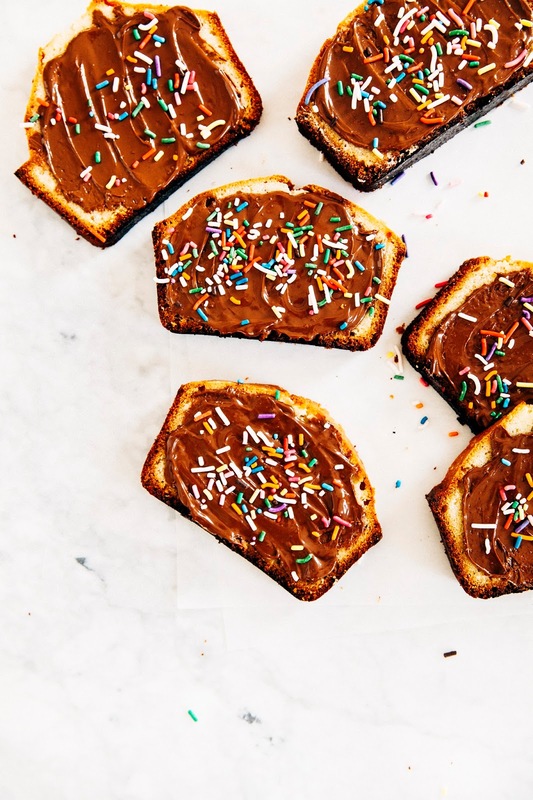 When topped with your favorite spread like peanut butter, it's like eating a FROSTED cake, minus the all the fuss and hassle of actually frosting a cake. 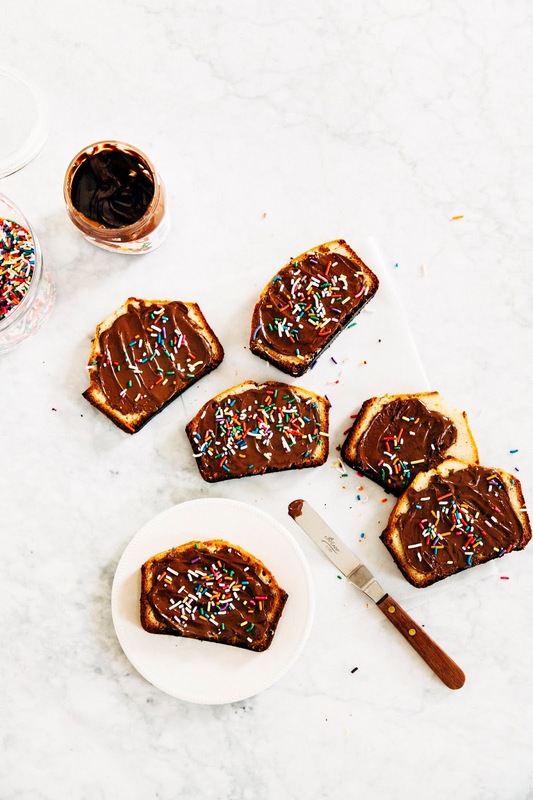 Of course, I'm partial to Nutella, which gets all gooey and warm when spread on the toasted slice and makes the whole party taste like a classic yellow birthday cake with chocolate frosting (the sprinkles don't hurt either). 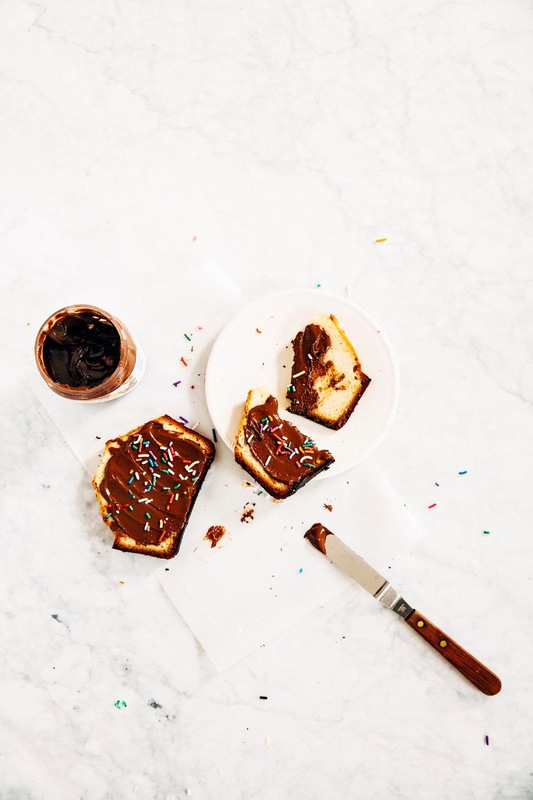 But really — nut butters, cookie butters, jams, jellies, curds — it all works here. It's #caketoast. ras el hanout loaf cake toast with yogurt and sesame sprinkles! Tip #1 — Unless you're a blogger like me and subject to aesthetically pleasing cookware that's not the most practical, use a thick, light colored pan. I'm partial to these professional ones at Sur La Table made of heavy duty aluminum. Dark colored pans conduct heat more easily and get hotter. We don't want that; we're trying to avoid burned bottoms here! Tip #2 — Wrap the bottom of the loaf pan in aluminum foil, with the shiny side facing outwards. It helps keep the edges light! This is a trick stolen from Sarah Kieffer's picture-perfect cheesecake. 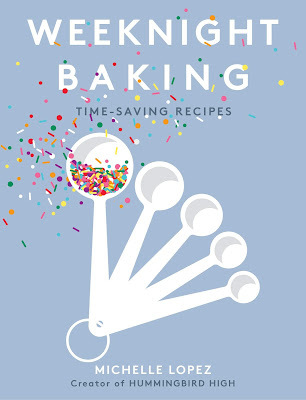 Tip #3 — Stick the loaf pan on a heavy duty baking sheet to double-up the metal. This creates an extra layer that the heat has to penetrate, slowing down the baking process of the bottom of the loaf even further. Center a rack in the oven and preheat to 350 (F). Prepare a 9 x 5-inch loaf pan by spraying generously with cooking spray. Cover the bottom and sides of the loaf pan with aluminum foil, with the shiny side facing outwards. Set aside. In a medium bowl, whisk together 2 cups all-purpose flour and 1 teaspoon kosher salt. Set aside. In the bowl of a freestanding electric mixer fitted with a paddle attachment, combine 1 1/2 cups unsalted butter, 1 1/4 cups granulated sugar, and 1 teaspoon pure vanilla extract. Beat on medium-high speed for 10 minutes, making sure to beat at least 5 minutes minimum, using a rubber spatula to scrape down the sides of the bowl as needed. After beating, the mixture will be very pale, light, and fluffy. Lower the mixer setting to its slowest speed and add 6 large eggs, one at a time, only adding the next egg once the previous egg is fully incorporated into the mixture. Once all the eggs have been added, scrape down the sides of the bowl. With the mixer still on its lowest setting, add the flour mixture all at once, beating until the flour has just about disappeared into the wet ingredients. The mixture will be a thick, homogenous, pale yellow batter that is less liquidy than traditional cake batter. Spoon the batter into the prepared pan, using an offset spatula to spread it evenly across the pan and smooth the top. 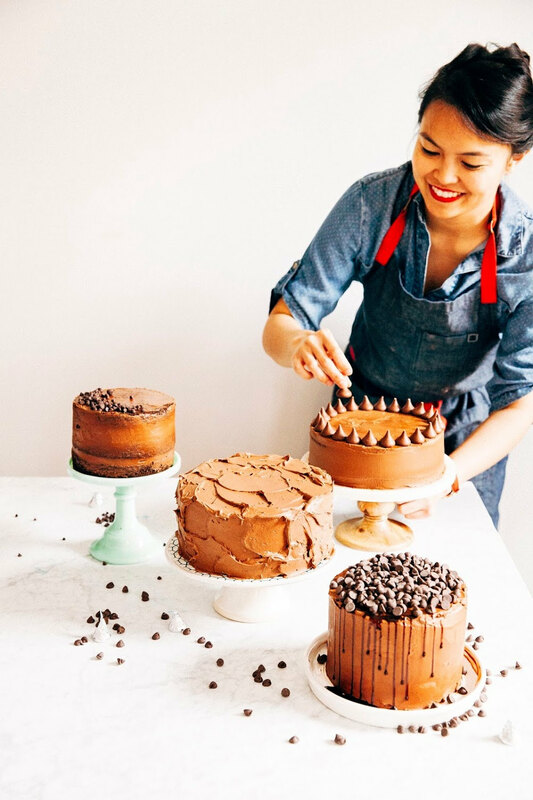 Set the loaf pan on a baking sheet, and transfer to the preheated oven to bake for 50 to 55 minutes, or until the top of the cake has domed and cracked in a signature loaf cake kind of way and a skewer inserted into the center of the cake comes out clean. Transfer to a wire rack to cool for 10 to 15 minutes, before turning out the cake onto the rack to cool completely. 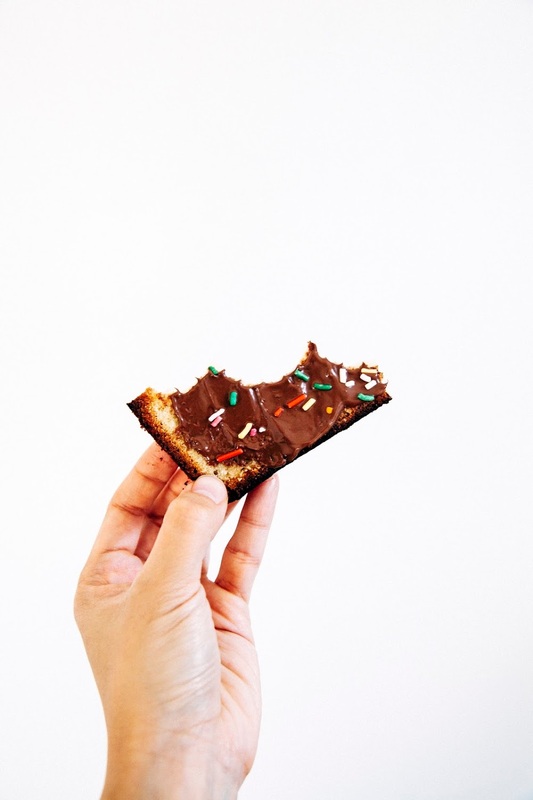 When ready to enjoy cake toast, use a serrated knife to slice about 1/2 inch piece of cake from the end of the loaf. The slice should resemble a piece of sliced bread. 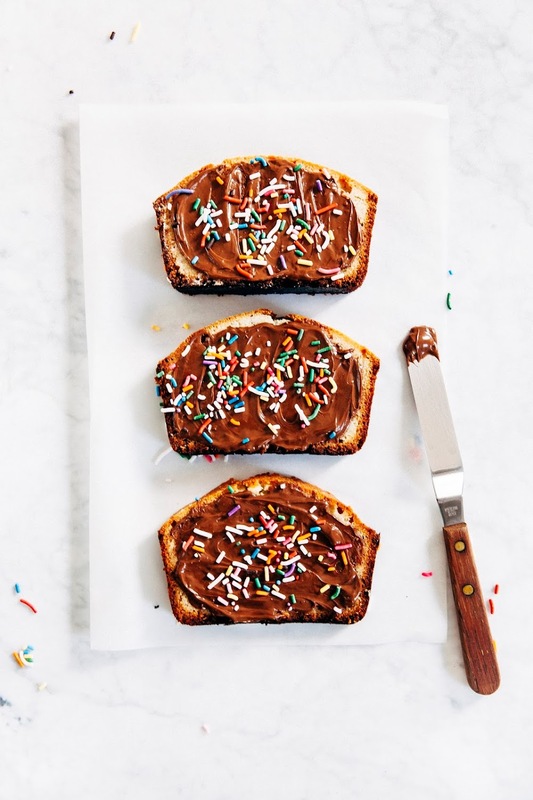 Toast in a toaster for desired warmth and brownness, and serve immediately when done. 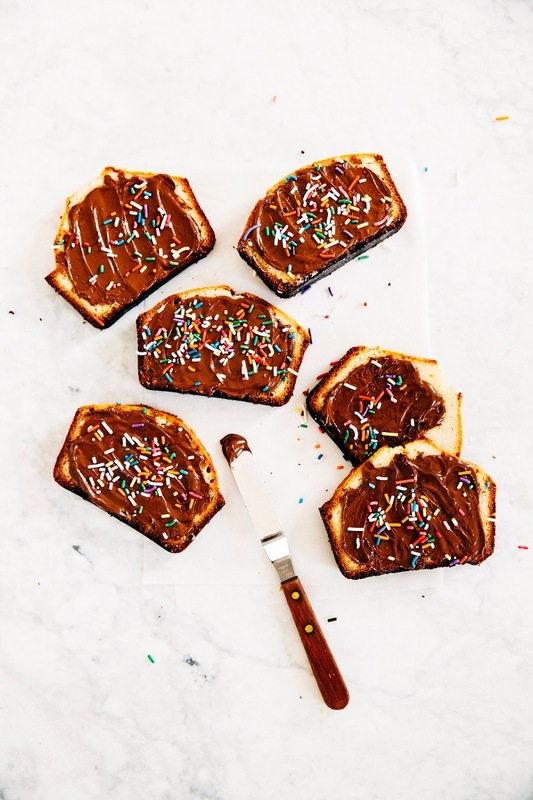 Use a butter knife or an offset spatula to spread Nutella, Speculoos, peanut butter, almond butter, fruit jams and curds on the toasted slice to enjoy!